위 주소로 들어가시면 영문패턴 사이트가 나옵니다. This is just a tutorial to show you how to make the clamshell pattern, which you can then go on to use for whatever project you like. Cushions, blankets in all shapes and sizes, bags, wraps or anything else you can think of. So the choice of yarn, yardage, hook and size of the project depends on what you choose to make! WRITTEN PATTERN: Abbreviated instructions for the pattern can be found at the end of the post, if you're happy to work from them alone, free feel to jump to the end right now. We need to start with a chain. 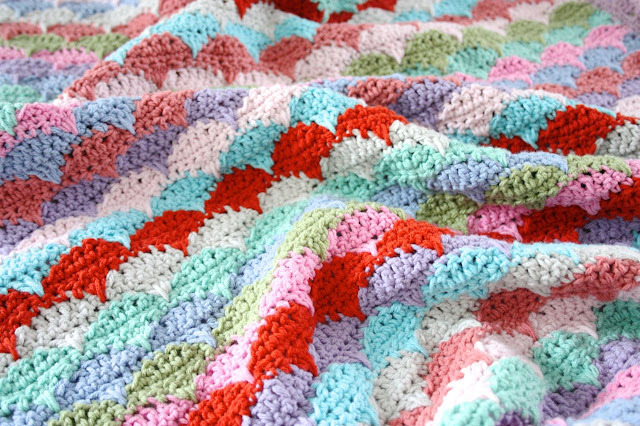 The number you start with depends on how big you need to make your blanket, cushion, or whatever. But you need to follow this rule: It needs to be a multiple of 8, plus 2. Make a double crochet in second chain from hook, and then make one double crochet into each chain all the way to the end. Turn the work and chain one. Make a double crochet into the first stitch, and then make 1 double crochet into each stitch along the row right to the end. Now you've finished the 'set-up' rows, we're ready to start working the pattern rows. 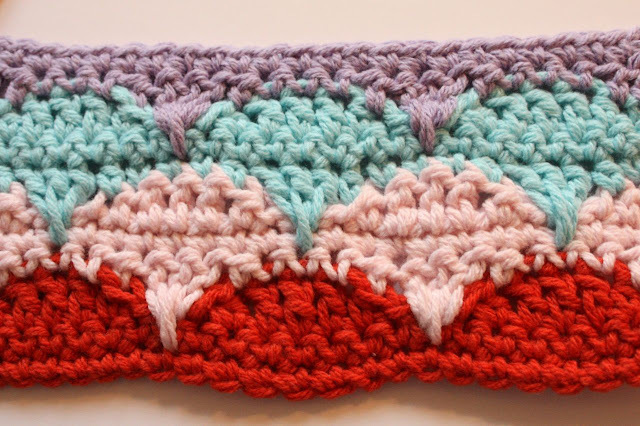 Turn the work and make a slip stitch into the first stitch of the row. Then, make another slip stitch into the next stitch along. Next, make 1 treble stitch into each of the next 3 stitches. Then make a half treble into the next stitch and then to finish this 'bump' make a slip stitch into the next 3 stitches. Now it's just a case of repeating what we've done so far. So, you'll need to make 1 half treble, 3 trebles, 1 half treble and then 3 slip stitches to make the next 'bump'. Carry on making these bumps along the row till you get to the end. You should finish having just made 3 trebles and 1 half treble and then have 2 stitches left to work. Then work a slip stitch into each of those last two stitches. Now it's time to turn your work and this is where we change colour too. Attach your new colour and chain 3. Make 1 treble into the next stitch. Then make one half treble. Next make, 1 double crochet into each of the next 3 stitches. Ok, now we come to the tricky part of this pattern. We're going to make the CLAMSHELL SPIKE, as I'm calling it! This is the part that makes those lovely points at the bottom of each shell. First of all, we need to skip over the first slip stitch and make a treble into the dc under the second slip stitch. (That's the dc of ROW TWO) Have a look at the picture (above left), you can see I've indicated where the hook is going to go. Then complete the treble stitch in the normal way. You can see in the picture (aove left) the stitch just looks a little longer than normal. Now we need to make a second treble. This one is going to go into the same place, but just one row lower. See where my silver hook is pointing in the picture (above right)? As before, pull your yarn through as for a normal treble stitch, but just pull it up a little further so it's clear of those rows below and then finish the treble stitch like normal. When you push your hook in to make the stitch, you'll also want to make sure that you're not getting caught up in the treble stitches at the back. See the picture (above left) taken from the back, see how I've made sure those other stitches are on the right-hand side of my hook? If you're not careful the hook goes into the middle of those stitches and you don't want that, it'd look all wrong! I know this part sounds a bit faffy and fiddly, and I grant you it is a bit for the first couple of stitches. But, I promise you, after you've got used to it and done a row or so, it won't be a problem. Okay, after you have your hook in the right place and have completed this third treble, you should have something that looks like this (above right). A nice pointy CLAMSHELL SPIKE! Now we need to make 1 half treble. So skip the last slip stitch and make the half treble into the half treble of the row below. Then one more half treble and you're ready to make another CLAMSHELL SPIKE. If you need to, scroll up and follow through those instructions again to make the spike. Then work, 1 half treble, 3 double crochets, 1 half treble again. Repeat this along the row until you get to the last two stitches. You should end having just made, 3 double crochets and then 1 half treble and have two stitches remaining to be worked. Make 1 treble crochet into each of those last two stitches to complete the row. Turn the work, chain 1 and then make a double crochet into the first stich. Then, make a double crochet into each stitch along the row. Turn the work and chain 3. 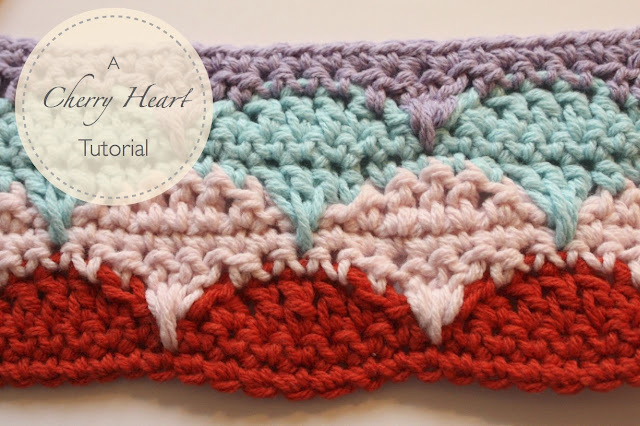 Make a treble crochet into the next stitch. Then make a half treble crochet. Next make a slip stitch into each of the next 3 stitches. Then work 1 half treble and then 3 treble stitches. Then finish the 'bump' with a half treble and then 3 slip stitches. Continue on in this way to the end of the row, making, 1 half treble, 3 trebles, 1 half treble and 3 slip stitches. You should end having made 3 slip stitches and 1 half treble, with two stitches left to work. Make a treble into each of the last two stitches to complete the row. This is where we need to change colour. Turn the work and attach the new colour yarn. Make 1 double crochet into the first two stitches. Now we're ready to make a CLAMSHELL SPIKE, just like we did before. Using the picture (above right) as a guide, skip the first slip stitch and work a treble into the dc below the second slip stitch (ROW FIVE). Then work a treble stitch into the dc of the row below that (ROW FOUR). See picture (above left). Then work the final treble into the same place as the first treble, into the dc below the second slip stitch. See picture (above right). Remember with this last treble, to push the rest of the spike stitches to the right of your hook on the back of the work. (Above left). You should now have completed your CLAMSHELL SPIKE. Next we need to skip the third slip stitch and work 1 half treble, 3 double crochets and 1 half treble. You'll now be ready to work another CLAMSHELL SPIKE. Repeat these instructions to the end of the row. You should end with just 2 double crochet's instead of the usual 3. Turn the work, chain 1 and make a dc into each stitch along the row. Now you have all the information you need to create the pattern. So to make more rows of the pattern all you need to do, is scroll back up to ROW THREE and repeat the instructions from that point onwards to continue making pattern repeats. Until the blanket or whatever it is you are making is the length you'd like it to be. In the picture (above right) I've completed ROW THREE to make finish off the bumps in the turquoise colour, and then followed the instructions for ROW FOUR AND FIVE to start my next lot of clamshells. When you have the length that you want, I'd recommend that you end on either a ROW FIVE or a ROW EIGHT, so you that you finish with a nice straight edge. Once you've got used to the pattern, you'll probably only need a little reminder to keep you on track so I've included some written instructions below for you to use as a quick guide. 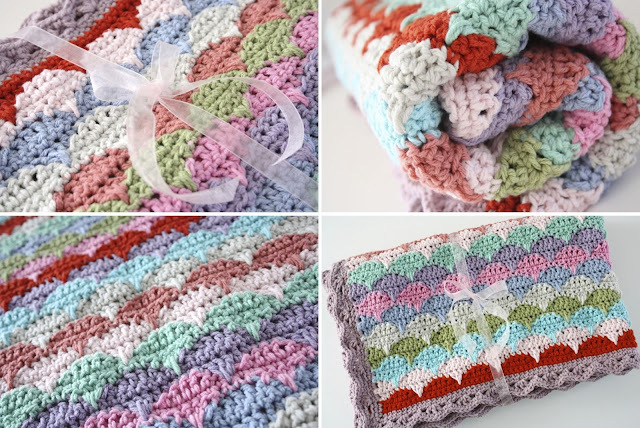 I really hope you enjoy this tutorial and I'm hoping you'll want to make lots of lovely things using this pattern. 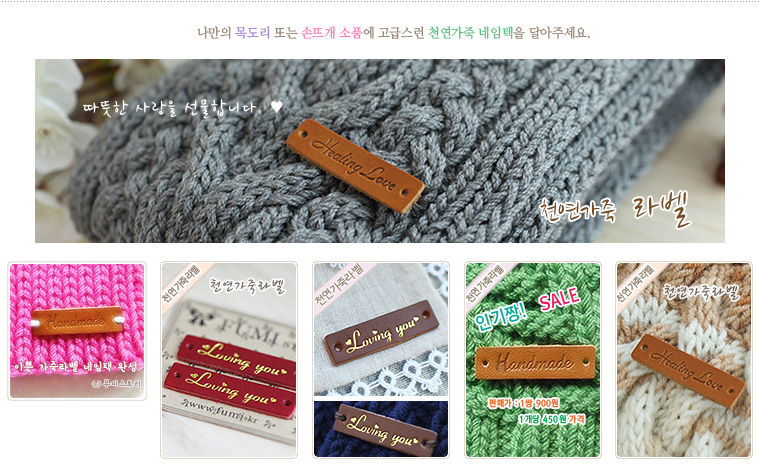 Cherry Heart's Cozy Corner on Ravelry?